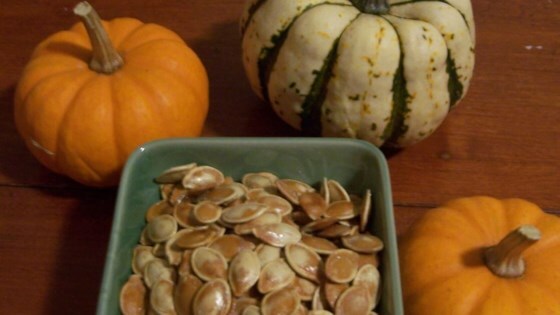 "This is what you can do with all those seeds after the Jack O' Lantern is carved! Any seasoning will work in place of salt. Try Cajun!" I followed the directions exactly and burnt the seeds. I'd suggest a lower temp or a shorter time. Try this recipe with cinnamon, sugar, and salt. The salty-sweet mix is excellent! Also, instead of cooking oil, I used non-fat cooking spray to make it lighter. That worked just fine! Excellent and easy. I sprayed vegetable oil on them and I used sea salt which gives a robust salty taste. I say it took 20 mins. for the seeds to brown. This recipe seemed really good, but my oven roasted them to a dark brown in 10min! Am I doing something wrong? They'd be unidentifiable little black smears if I left them in for 45min!